FOR DIANA PRINCESS OF WALES. BY DAVID SMART AND BRIAN WATSON. © SMART/WATSON. Diana Princess of Wales was, and still is one of the greatest icons of our time. No other human being has ever had the following that she had and, remarkably still has. Even in death she has a following second to none. 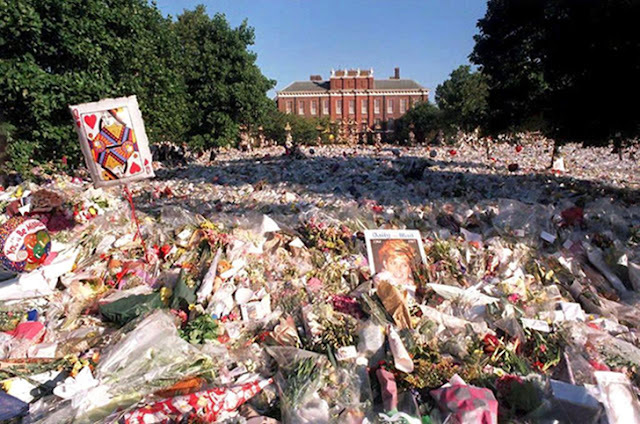 The incredible love for the beauty that was Princess Diana is still as strong as ever, her millions of fans the world over still portray and voice their affection on a daily basis. This musical is a celebration of that undying love. There is no mention of conspiracy theories or other such distractions, this musical is written to make every Diana fan the world over leave the theatre elated. We would hope to include Princes William and Harry in that elation. As each scene of the Royal Fairy Tale unfolds in spectacular fashion, a story within the story portrays the intrusive involvement of the media and the unrequited love of a TV journalist for the People’s Princess. The closer he is required to get to Diana, the stronger his love for Her Royal Highness becomes. His emotions reflect the feelings of the millions of Diana fans the world over, thus enabling every member of the audience to re-live their fantasy through our leading man. His frustrations will echo their frustrations. His anger will echo their anger. His love will echo their love. Each scene takes us through Princess Diana’s fascinating Royal journey. Starting with a rousing overture that gives us the flavour of the spectacular tracks which carry us through Act One, the curtain rises to reveal a media newsroom, it’s August 1997, a news briefing is in place. A TV News Editor and a Newspaper Editor are addressing their staff, and congratulating them on making so much money out of the reporting of Princess Diana’s Royal life, to date. As they hand out large bonuses, we realise that these media men are the villains of the piece. This is confirmed as the two Editors promise even bigger bonuses if their journalists, reporters and their Paparazzi return with sordid detail of Princess Diana’s up-coming trip to France with the new man in her life, Dodi Fayed. Only Ben speaks out against this unsavoury treatment of the wonderful, Diana Princess of Wales. With a scene change within the scene, we see the modern, stylish Icon Princess Diana had become. She, and her entourage cross the stage on a rising catwalk, they are followed by so many Paparazzi, their motorised camera’s flashing, that it’s difficult to see the Princess being interviewed by Ben, to camera, as she moves through the scene. This graphically portrays her journey to France. The two News Editors, Ben, and Chorus break into a song: ‘She’s Good News’. The lights fade as the curtain comes down. Now, accompanied by severely discordant music, the curtain rises again, it reveals a blue gauze curtain. It’s August 31st 1997, beyond the blue gauze we can vaguely make out the scenes under the Alma Tunnel in Paris. This, punctuated by shouting French voices, police and ambulance sirens and the motorised cameras of the Paparazzi, we get a glimpse of the horror which befell Paris. With the brief scenes of Paris on that fateful August night out of the way, the stage descends into darkness. From the darkened stage we hear the dramatic throwing of switches as spotlights pick out two TV Newsreaders, one after the other. Between them, in the early hours of Sunday morning, they emotionally deliver the news that “Diana Princess of Wales has died”. The TV News Readers are broadcast to TV sets which adorn the walls all around the auditorium. As the News Readers go ‘off air’, they share a song: ‘Sad Song’. A song which reflects the feelings of a world in total shock. The stage fades to an eerie blackness. The curtain once again rises, this time to reveal the poignant scenes outside Kensington Palace, a palace almost buried under a sea of flowers, a scene which will involve members of the audience in an original, unique and spectacular participation. As the cast enter the auditorium they pass through the aisles collecting everyone from an aisle seat who was given a flower as they were seated. All these audience members are taken onto the stage to lay their flowers on the ever growing pile. As part of the number, which is featured in this scene, a young girl’s voice spookily echoes around the auditorium, she sings the name, ‘DIANA’, the song title. Once the stage clears of the public, our TV Journalist, Ben enters, coat collar upturned, he lays his flowers among the vast array of blooms, his sung words appropriately portray his/the public’s love for the lost Princess. The stage, once again descends into darkness as the curtain falls. With tricks of the lights, the curtains and a musical interlude, we are taken back in time. As the curtain rises we find ourselves back in the early 80s, on a military parade ground as, with much comedy a Sergeant Major is receiving his orders from his commanding officer. He is ordered to drill his men in preparation for Lady Diana Spencer’s arrival into the Royal Household. Soon Lady Diana will arrive to inspect her new Royal guard. However, the Sergeant Major has some work to do first, as he instils some good old fashion ‘spit and polish’ into his men via a lively comedy song entitled; ‘A Sergeant Major’s Job’. A monumental scene follows, a scene worthy of a place in some of the classic stage musicals of the past. The announcement of the Royal Wedding is posted on the gates of Buckingham Palace, this throws the exterior of the palace into a huge song and dance spectacular. People from all walks of life join in with ‘A Right Royal Wedding’, to show their delight at the news, and to congratulate the Royal couple. In among the party atmosphere an ‘Outside Broadcast’ truck arrives on the scene, the side of the truck removed so the audience can view the action inside. Ben is in ‘make-up’, as, with mixed emotions he prepares for his live broadcast from outside Buckingham Palace. The climax of the scene is the newly married Royal couple leaving in the open landau, complete with white horses and followed by the band of the Grenadier Guards in full flow, the sound of the military band leaving no member of the audience unmoved. Time moves on to the next scene. We are outside Kensington Palace, in the Royal Park, waiting for the imminent news of the Royal birth, along with our ‘villains’, Paul and Des, the News Editors. Rubbing their hands together at the extra income that will land in their pockets from the news and pictures of a Royal Baby, Paul and Des, break into song. ‘Quids In’ is a funny and characterful number, which clearly spells out that the Editor’s interest in making money far outweighs their thoughts for Princess Diana’s welfare. As a whole host of Norland Nannies descend on the park, in a beautifully choreographed striking scene change within a scene, we are transported, by a moving set, into the interior of the Royal nursery. Princess Diana and ‘Nanny’ are in conversation as they settle the newly born Prince William into his cot. With total innocence, Nanny remarks: “I’m sure Prince Charles is very proud of his little Willy”. Chuckling with embarrassment, Princess Diana responds; “Yes, Nanny…but I think we’ll refer to the baby as William, or Wills for short”. The nursery set moves off stage, it reveals more Norland Nannies gathering for their walk in the park, the Orchestra accompanying them prior to the nursery set returning. On its return, the nursery is dressed differently, heralding the arrival of the second Royal baby, Prince Harry. As Princess Diana confides in Nanny; “My fairy tale should now be complete”, they walk off into the park to join the other Nannies. In choreographed action, the walking Nannies break into song, ‘Fit For A Prince’. The number is full of surprises as the Nannies take off in synchronised flight, the perambulator version of the Red Arrows. Eventually all of the Nannies leave the stage, symbolically leaving Princess Diana standing alone in the park, the lights dim to a shadowy, spooky twilight. From out of the shadows the villains appear, the News Editors, along with their nasty paparazzi. Sensing Diana’s loneliness, our News Men get a whiff of a Royal divorce? The stench of much more profit goads the pack into plotting their devious news stories. Trying to outdo each other with vicious headlines, they leave the audience on edge with trepidation. Princess Diana is left eerily lit only by the flashes of the Paparazzi’s motorised cameras. 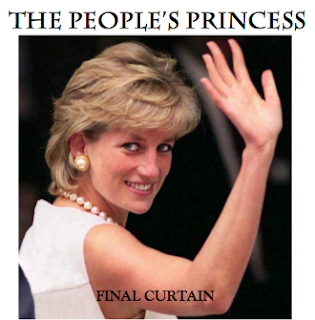 The curtain rises on the second half, as the scenes move on they reflect the emotional and tormented state Princess Diana found herself in. Scene 1 depicts the start of Diana’s emotional battle, as she shares the first clues that all is not well in Britain’s latest, and most famous Royal marriage. The set is a magnificent representation of the ‘Upstairs and Downstairs’ within Kensington Palace. The audience sees the ‘Upstairs’ positioned above the ‘Downstairs’, an exploded view. Upstairs feels cold, full of ‘grey’ Royals and VIPs. Downstairs has a cosy feel, with the staff all smiling and welcoming as they go about their business. As Princess Diana is about to make one of her very regular visits Downstairs, the staff all burst into song, ‘She Speaks My Language’. Princess Diana, still Upstairs, dances a beautiful ballet through the rooms and among the unresponsive Royals, as she joins in with the song, she touches the ‘grey Upstairs’ people, they topple and fall to the ground. Symbolically, they aren’t real at all. As the Princess arrives in the cosiness of the Downstairs, her Lady’s Maid and personal Butler sense that she wants to confide in them. Shooing away the rest of the staff, they engage in sympathetic conversation with Princess Diana. This conversation soon turns into another wonderful song, ‘Don’t Let It Get To You’. The lights fade, as the curtain falls. When the curtain rises, we are in the heat of the Indian sunshine, outside the Taj Mahal. Princess Diana is sitting alone on a stone bench with the backdrop of the most romantic palace in the world. An exact replica of the infamous photograph which adorned all the news media, reflecting the loneliness the Princess was now feeling, and showing to the world’s cameras. Under the veil of the loneliest Princess in the world, Diana sings a song from the heart, ‘Can’t Take My Love Away’. As we come out of the song, we reveal that the Princess is surrounded by news crews from across the globe. Surrounded by hundreds of people, yet still very alone. Ben is there, he is reporting to screens across the UK and beyond. As he does his job, as he delivers his lines, he feels the loneliness the Princess is feeling. His outside broadcast is also broadcast to the TV screens around the theatre auditorium. When the world’s media move away, they leave Ben at one side of the stage and Princess Diana at the other. Ben breaks into song, ‘The Story’s Not Over’, to be joined by the Princess. Unbeknown to each other they sing the song as a duet. Not singing to each other, but they could be. The set begins to darken, lights make a feature of Princess Diana’s only dance partners, the spectacular dancing water fountains of the Taj Mahal. The curtain falls. As Diana moves deeper into the black hole of depression, as she fights the upheaval of impending divorce, she turns to her wardrobe, her fashion was the start of her reinvention. The curtain rises on a pure white limbo set, dressed with white ‘shop window manikins’. The only colour on the stage comes from the famous designer gowns out of Diana’s wardrobe, they are worn by the shop window manikins. A small office set moves slowly across the stage, complete with a group of fashionistas. They bring more of the manikins on stage and dress the manikins in more of Diana’s famous gowns. The fashionistas break into song, ‘A Passion For Fashion’ is an upbeat number which reflects what the Princess’ clothes did for her mood. As we come out of the song, Ben appears, with a small film unit, there to interview Diana. With fumbling embarrassment, Ben apologises to the Princess, “I don’t think I should be asking these personal questions”. After putting Ben at his ease, the Princess answers his final question with a song. A show stopper of a number, ‘I can Only Dream’. During the song, Princess Diana dances through the manikins, she touches them, and, one at a time they come to life and dance with Diana in a beautifully choreographed routine. Ben sings a couple of appropriate lines from the number, as he exits the stage. Leaving the Princess alone, to finish the song. The lights fade slowly and the curtain comes down’. As the curtain rises once again, the mood changes. We are in the hustle and bustle of the ‘News Offices’. There is much excitement at the fact that Princess Diana will be interviewed live on TV by Martin Bashir, that very evening. Ben is being briefed by his News Editor to cover the show. Reluctantly, he takes his orders. However, the banter and the rudeness directed at the Princess finally hits Ben’s emotions hard. He cracks and launches into his own tirade of abuse, directed at his bosses. Walking to centre stage, Ben is picked out by a solitary spotlight. In despair he speaks out loud, “They haven’t listened to a word I’ve been saying”. Music up, Ben sings, ‘ Listen To Your Heart’. The song is full of advice that Ben would give, and the public would give to Princess Diana, if only they could speak to her. As the song comes down, Paul, Ben’s boss reminds Ben that he is reporting on the Bashir Interview, “Don’t miss one nod of the head, Ben, Bashir’s going to get the truth tonight, your Princess Di will spill the beans on prime time telly”. Paul’s laughter echoes around the auditorium, as Ben, now in a single spotlight shouts out loud, “ NO! She really mustn’t do this…it could destroy her. With a catastrophic musical punctuation, the curtain comes down. The next scene is the ‘darkest’ in the whole show, as it depicts the outstanding Martin Bashir interview. The interview where Princess Diana opened her heart to the whole world on prime time television. We are in a similar set to the one used in the original Bashir interview. The interview is coming to a close, the TV Director wants a retake. The interview is broadcast in close up on all the TV’s around the auditorium. Ben is among various journalist covering the interview from the press room at the side of the studio. He looks distraught and on edge. As the retake draws to a close, Princess Diana delivers her infamous answer, “Well, there were three of us in this marriage, so it was a bit crowded”. The Director calls, “Cut”. The orchestra plays the intro to another song, as Diana’s words, “Three of us in this marriage” echo around the auditorium. Princess Diana gets up from her seat, moves to centre stage, the lights dim, she is picked out by a solitary spotlight. She sings, ‘Love Double Cross’. Throughout the song, the Princess is covered in close up on the TV screens all around the auditorium. We see her hands in close up, toying with her wedding ring, sliding it on and off her finger. As she sings the final chorus, Princess Diana takes off her wedding ring completely and grasps it in her right hand. The spotlight on Diana fades, leaving the stage in complete darkness. The image of the Princess’ hand minus her wedding ring stays on all the TV screens. A very significant image of the finality of divorce. The curtain falls. As part of her resurgence, Princess Diana devoted herself to her charity work, especially working with children and the sick. As we join the next scene, Ben is seated at his desk, lit by a single spotlight he is typing out his script. He reads it aloud as he is typing. Coming to a close, Ben’s final line, “…a stronger, more positive picture of the People’s Princess was beginning to appear”. The spotlight illuminating Ben fades, simultaneously a second light fades up, it’s a bedside light alongside a child’s hospital bed. We see Princess Diana sitting reading a story to the little girl who occupies the bed. More and more bedside lights illuminate, revealing more and more, sick children. The children all climb out of their beds and rush across to the Princess. One little girl says to Princess Diana, “My mummy says that I have to call you, your Royal Highness….is that because you’re higher than me?” Princess Diana responds, laughing, “I guess it could be….but I would really quite like it if you just call me Diana”. 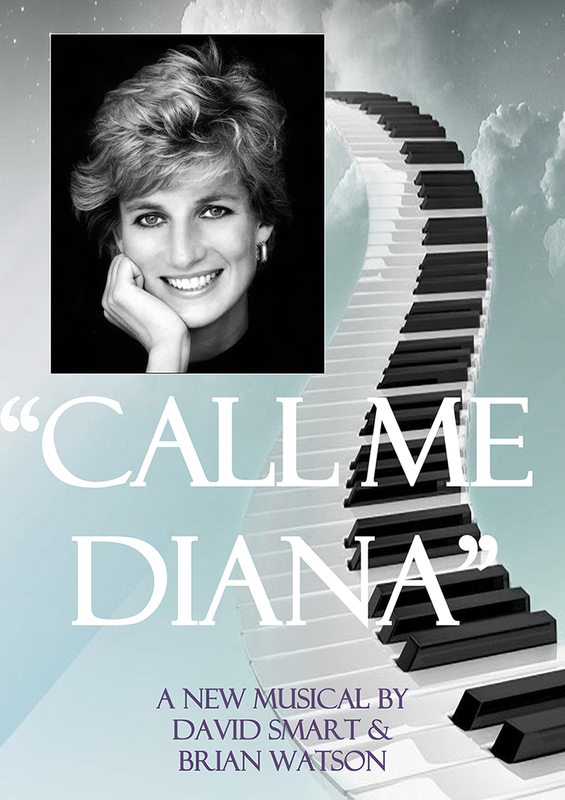 The music introduction builds to the song, ‘Call Me Diana’, sung by Princess Diana, the children and other patients. More and more patients are wheeled in, in wheelchairs, in beds. Many walk in. The patients nurses and doctors all join in. This wonderfully uplifting song builds to a magical ending as the curtain comes down. The curtain rises on an all-white set, the only colour emanates from a series of life-sized empty picture frames. A ‘new look’ Diana, new hair style, new fashion sense, looking every bit the image created by photographer Mario Testino, she sits, once again being interviewed by Ben. As an embarrassed, Ben poses more ‘crazy’ questions, Princess Diana puts him at ease. As Ben, behaving somewhat like a love-struck teenager poses his last question, “You’re now a single woman, free from all that uncertainty….your smile has certainly been re-energised. You are now facing a future rich with promise….I can honestly say that you look, sound and feel alive again… Princess Diana interrupts Ben, “I think you’ve got it spot-on, Ben….yes….I’m alive again. As the music builds the Princess gets to her feet and performs the wonderful song, ‘I’m Alive Again’. A whole entourage of dressers, with some of the ‘new look’ Diana dresses, enter with a photographer. The dance routine includes the changing of Princess Diana’s dresses. In each new outfit she poses in a different picture frame as the photographer snaps away. They recreate the now famous Mario Testino photographs. Each frame a different famous image. In the final frame Diana poses in the beautiful ball gown that she will wear for the finale, she beckons to Ben to come and join her. They pose. The camera flashes. The lights go down. The music returns to the up tempo finale number, ‘We’ve Got You’, now sounding even bigger and more uplifting than before. The singing becomes far more enthusiastic. There’s a feeling of elation, a feeling which portrays just how lucky we all were to have lived alongside.